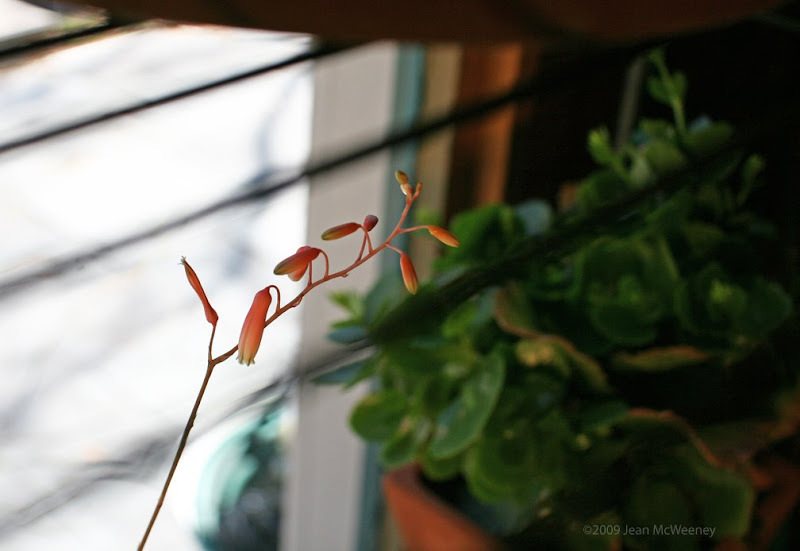 It's Garden Bloggers' Bloom Day for the month and what fun to see what's blooming in January! GBBD was started by Carol of May Dreams Gardens and you can get links to everyone's post on her blog. I'm starting off with Quince, usually a reliable bloom for January here. Right now there's only about two blooms but I'm hoping the bush will be covered in a month. Next comes my old reliable Marie Pavie rose. This is an OGR, "old garden rose". 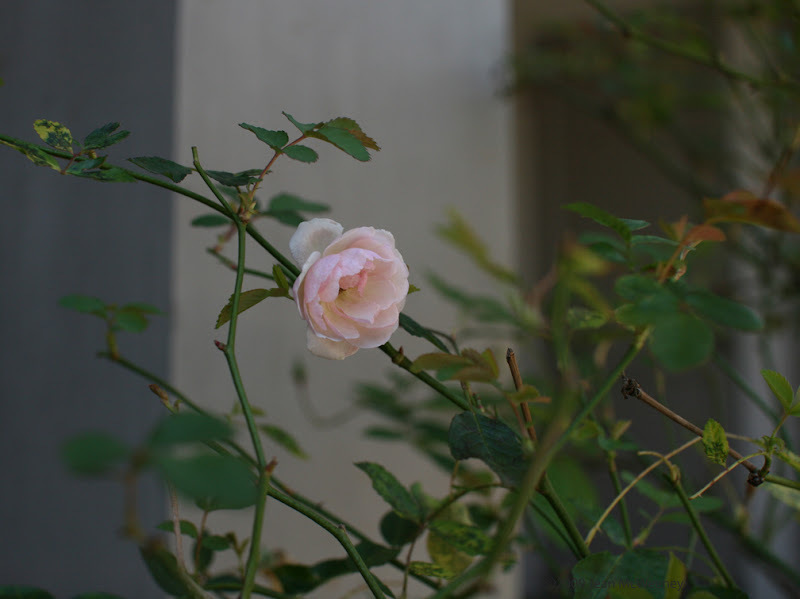 It's classified as a polyantha rose and was bred in France in 1888. Marie Pavie is rarely out of bloom. This time of year the old leaves are covered with blackspot but many new leaves are forming. I grow this in a pot and leave the pot close to where I pass each day, for its wonderful fragrance. Last GBBD I included a shot of a Lizard Lips bloom. Here's another one. It's a little difficult to see because it's in my storeroom against a window. For those who don't know, this is the bloom of an aloe plant. The photo after the bloom shows the whole plant. It blooms constantly but they're small delicate blooms. I've also got some calendula and pansies blooming but my favorite photo is of some blooms to come - daffodils! Some of my daffodils have buds on them so I had to cover them last night. I have never seen an Aloe bloom. It is amazing to see daffodils coming up when I am watching it snow :). Have to love Blotanical and all of the gardeners on it to cheer up your day. Thank you for the rose also. 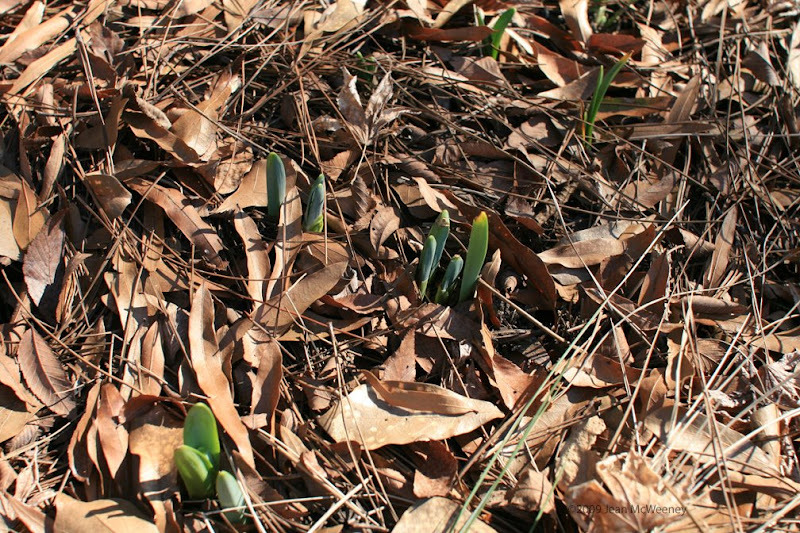 I also love the look of daffodils peeking through and giving a little hint of what's to come. I think that's why I like plants so much - they're such a great lesson in delayed gratification! I noticed the daffodils coming up this morning. Isn't Marie Pavie a great rose? Your Quince bloom is gorgeous! I started growing blubs and flowers in my greenhouse so that I can have some extra color in there. Thanks so much for sharing! This is the second time in the last 24 hrs. I have noticed Marie Pavie rose. It is calling to me. It has few thorns it seems. I saw your question in the comments on my blog about the greenhouse, but did not have an email address for you so I just answered them in the comments. If you like, email me through the website. Thanks! What a great rose to always have a bloom for you. Thanks for joining in for bloom day! Nice shots...the Marie Pavie is lovely. 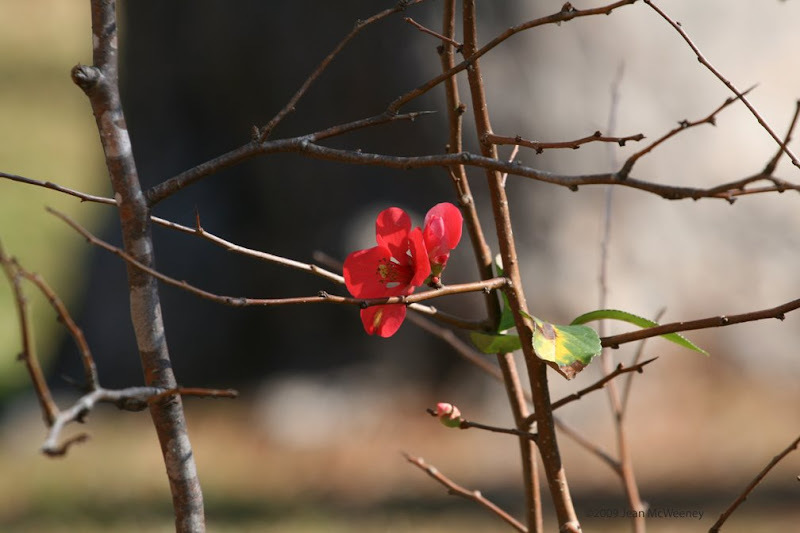 Flowering quince is one of my favorites and certainly one of the toughest shrubs even a black thumb gardener can grow. 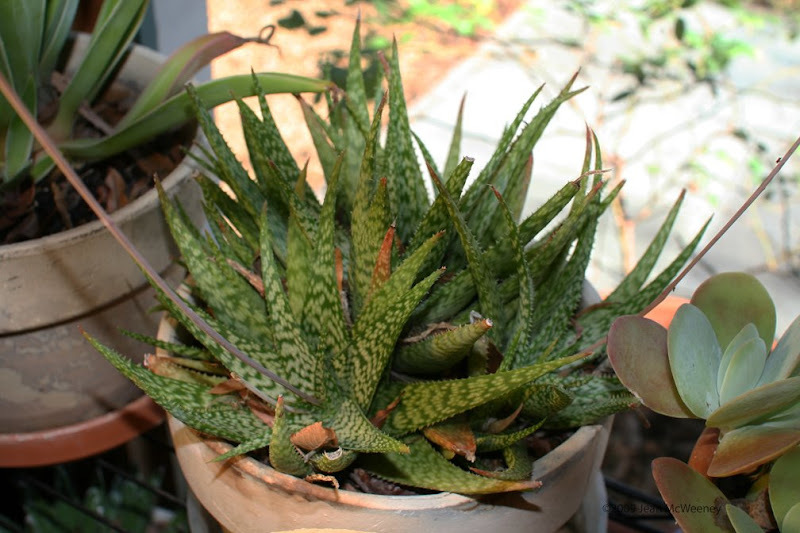 Wow, I have never had any luck with aloe-I can't believe you have one that blooms! My grandma has an aloe in a pot that's the size of a small child (the plant, not the pot), but I don't think it's ever bloomed. You seriously have to watch out for the thorns on those Quince bushes! Any tips on how and when to prune would be greatly appreciated...mine don't bloom that much for some reason. Raquel - I'm afraid I'm not much help on quince pruning. Usually I prune it when it's in bloom and I want a few sprigs for my house, that's about it. I have also pruned it when it is out of bloom, just to open it up. That doesn't seem to matter much as far as blooms for next year go. But this year, I haven't had as many as in past years. Not sure why. I-m late, but thought that quince was interesting...and it's bloom; GORGEOUS! Nothing I've ever had, but they must do ok in VA 'cause Racquel has one!! The Marie Pavie OGR? Amazing! I never get caught up on Bloom Day posts, but I'm glad I found yours on the 'posts you might have missed' list on Blotanical. The quince flower is such a beautiful color! Lucky you to have a rose that's always in bloom. Marie Pavie is a sweet beauty. I like the Aloe bloom too. I noticed today that my daffs are up about 3 inches, and there are a few tulips showing themselves. My snowdrops are only a couple of inches high but a few are beginning to form buds. Spring is coming to upstate NY....soon!